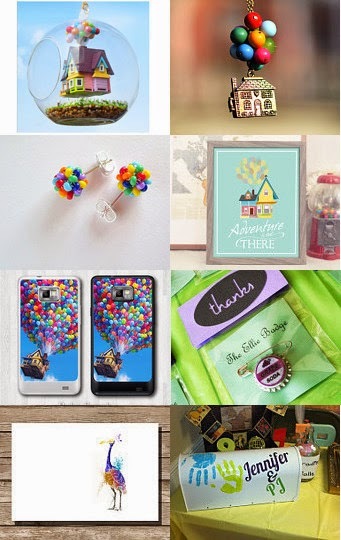 Etsy Treasury Tuesday: Up, up, and away! Today is another installment of Etsy Treasury Tuesday, where we ooh and ahhh over some of the beautiful items up for sale on Etsy! This week’s collection is inspired by one of my absolute favorite movie of all times: Up. I just happened to be on Etsy and saw an Up inspired print, and loved it. Little did I know so many great artists and craftsters had created oodles of great Up inspired pieces. How cool! Can you make it through the first 10 minutes of Up without getting a little teary eyed? I love your treasury list—there's something so happy about a bouquet of balloons! Thank you so much for showcasing my Rainbow Confetti Beaded Post Earrings. Great finds! There are cute.